Lawyers for President Donald Trump told the judge they are hiring a forensics firm to comb through a trove of documents seized when the FBI raided the property of his personal attorney, Michael Cohen, and said the President will be available "as needed" to review materials to isolate those they believe are protected by attorney-client privilege. Attorneys for Trump submitted a letter to the court ahead of a hearing Judge Kimba Wood scheduled for Thursday afternoon asking for an update on the government's production of copies of materials seized in the raid of Cohen's home, office and hotel room. Wood also asked lawyers for Cohen, the Trump Organization and the President to explain how they plan to vet the documents so the prosecutors conducting the criminal investigation can begin reviewing the materials. Earlier this month, Cohen's attorneys asked for a temporary restraining order to prevent the government from reviewing the seized documents. The judge denied it as moot after she decided to allow Cohen's lawyers to review the materials and assert how many they believe are privileged communications about legal advice. The US attorney's office for the Southern District of New York, which has previously said it is investigating Cohen for his personal financial dealings and does not believe he had many clients, is also expected to assess how many documents they believe are protected. After the review, the judge said she will determine whether a team of government lawyers not involved in the investigation, known as a "taint team," can review the materials for privilege or appoint an independent "special master" to handle disputes about what is protected communications. The judge said she wanted the review for privileged documents to be done quickly and asked the Trump-connected entities to explain how they would handle the review. Attorneys for Trump said they are engaging a forensic e-discovery firm to help sort through the documents and would hire a second vendor to engage contract attorneys if necessary. "Finally, our client will make himself available, as needed, to aid in our privilege review on his behalf," the lawyers said. "We therefore anticipate drawing upon our attorneys and the vast resources of the vendors we are engaging specifically for this matter to review documents relating to the President and generate any privilege log for him warranted by that review. We expect to be able to proceed promptly and efficiently," Trump's attorneys wrote. Cohen's lawyers submitted a letter telling the judge that the government indicated it would FedEx the first batch of documents by today, but by the time the lawyers submitted the letter they had not received the delivery. Cohen's attorneys said in the letter that they have an internal "Discovery Center" of 27 attorneys and technical experts prepared to "work around the clock" and have set up "war rooms" in New York and Washington, DC, to handle the evidence. "We have also developed a core team of eight key attorneys in New York and Washington who are experienced in managing white collar matters and large document reviews. We can add as many other attorneys as needed," Cohen's lawyers said. Lawyers for the Trump Organization, where Cohen worked from 2007 to 2017, said in a letter they had "abundant resources" to review documents and would give Cohen's lawyers names, email addresses and keywords to expedite the review. Cohen's attorneys are expected to share information relevant to the president and the Trump Organization so they can also make claims that certain documents are privileged. 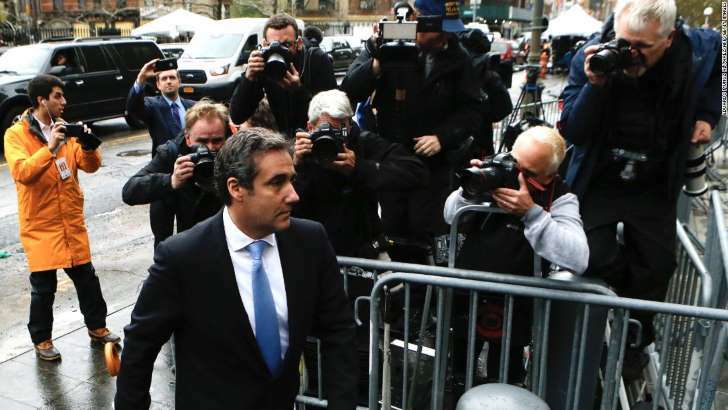 Cohen's lawyers said, "We continue to believe the fastest and most efficient way to protect documents covered by the attorney-client privilege and work product doctrine is to appoint a Special Master to address any disagreement over claims of privilege." The judge previously asked for recommendations of independent people who could serve as special master. Cohen's attorneys suggested four former assistant US attorneys in Manhattan. The government nominated three former magistrate judges.